PABLO – Melanie Smith noticed a drug problem in the valley that is affecting children at all ages and income levels. She works with the Department of Tribal Social Services and says drugs like heroin, ecstasy, cocaine, opiates, acid and methamphetamine are some of the common drugs in the valley. “Drugs are everywhere,” she said adding that the problem wasn’t just local. Smith decided to do something about the problem with a focus on the children affected by drugs in their environment. The first step was to get informed. She organized a three-day informational workshop starting on Tuesday that spread from Arlee to Elmo with help from CSKT Tribal Social Services, Youth at Risk of Homelessness and Trauma Informed Substance Abuse Programs. She invited a program centered in Colorado called the National Alliance for Drug Endangered Children (DEC) to lead several workshops. Police officers, judges, social workers, ambulance departments, teachers, parents and anyone else who works in any capacity with kids attended the workshops. They watched as presenters showed photos of toys sitting alongside meth pipes, but the images weren’t new to many. They watched with the hopes of finding a solution. 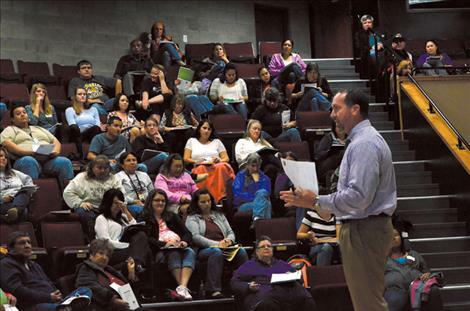 “We are not arresting our way out of this problem,” said Eric Nation, DEC director of training and development, as he stood on the Salish Kootenai College theater stage last Wednesday. Nation is a former police officer. He talked about helping kids affected by drugs with co-speaker and former child welfare caseworker Stacee Read. Collaboration was a word they often repeated. They suggested every group and agency on the reservation work to share information in an effort to be more effective. As an example, the speakers said that police officers can call a school and give them notice if a child was in a home where arrests were made so the school can support the child. Social services might also inform police of the location of a child’s room in case an arrest ever needs to be made in the home. “If you know a child is in that room, you approach it differently,” Nation said adding that the idea was for everyone to work together to improve the life of a child. The agencies were encouraged to work together to help children whether that means removing a child from a home or working to provide a family with needed services. “This is about helping children and each case may need something different,” Read said. CSKT Chief of Police Craige Couture attended the workshop. He said many agencies connected to law enforcement on the reservation often work together including city, county, tribal and highway departments, but he would like to see more collaboration. 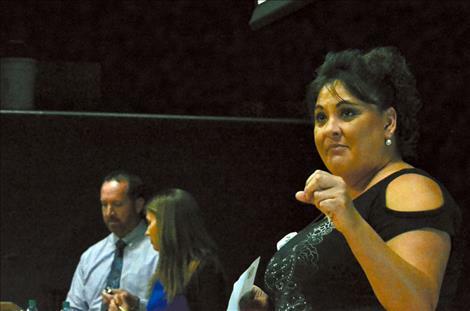 Many in the audience were interested in starting something to connect individuals and agencies on the reservation together so that they can share information to help support children, and school counselor Libby Frost thinks it’s a great idea. Smith said everyone needs to work together to help solve this problem. She is in the beginning stages of developing a collaboration group and wants to invite all the agencies and individuals across the reservation to join. She can be contacted at 406-675-2700 ext.1237 or 406-241-1251.